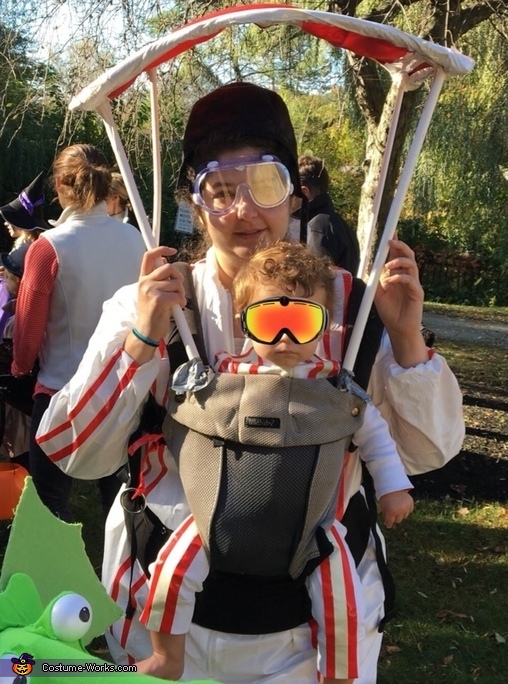 This is me and my baby dressed as tandem skydivers for Halloween 2017. We knew we wanted to to something that involved the carrier since he can't walk yet. We've done elaborate stroller costumes with my older child in previous years, but this baby doesn't like to stay in the stroller very much. We kept running through various ideas that we could do with the baby in the carrier and finally this one just came to us and seemed like a hoot, so we "took a leap" on it (get it?). It was so much fun and the baby loved it. It was a hit with everyone who saw us, and it was easy to see us because the jumpsuits even glowed in the dark! My husband made everything, including the jump suits and our parachutes. Thanks for considering us. We love Halloween and it would mean so much to us to win!